That interactive map of bike-friendly routes through the city of Albany that the Albany Bicycle Coaltion has been working on is now online -- go have a look. The map/app will be formally introduced at an event at the Downtube Friday. 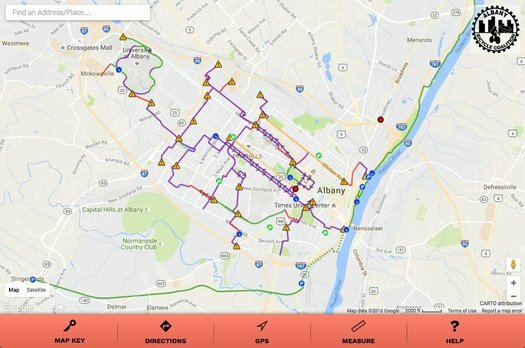 Objective: an online, interactive Albany bike map with bicycle-friendly routes. Primary considerations: safety and comfort. We especially want to encourage novice riders, visitors, and new residents, by showing that you can cycle throughout Albany on mainly bike-friendly streets. The map concentrates on secondary roads, side streets, and bike-pedestrian paths. Major arteries are used only where necessary to make connections. Traffic density is indicated by color coding. Traffic advisories, where needed, are indicated by "caution" triangles. The map includes preferred routes, bike shop locations, and there's even functions for mapping out a bike-friendly route between two places and measuring distances. It's also set up to work on mobile devices. ABC has been working on this project with Parks & Trails New York and Mohawk Valley GIS, it was funded in party through state grant money (coordinated by local state Assembly member Pat Fahy) and local donations.